The reality of 20th Century industrialized warfare meant that Canadian soldiers were issued far more clothing and equipment than they could conceivably carry on their backs. For this reason, kit bags were issued. Not intended to be carried in the front lines, they were usually left with the company or battalion baggage and used to store extra or follow-up clothing and other items that would be necessary for the soldier to have, but not needed at a moment's notice. Second World War kit bags were simple in design, being a khaki coloured canvas sack, with a sewn in bottom piece attached to a folded piece of canvas, sewn up along the side except for a 5 inch notch at the top. The bag was secured by a drawstring at the top, held by 8 brass grommets. A carrying handle was also sewn on to the bag, directly opposite the side seam, and reinforced with 4 rivets. Laid flat, the kit bag measured 16 inches across the top by 34 inches deep. The bag had a natural taper towards the bottom. For security purposes, kit bags were to be marked with the soldier's name, rank and service number only. Unit Serial Numbers were also marked on kit bags - every unit in the Canadian Active Service Force (later Canadian Army (Active)) was assigned a Serial Number. A colour code system was devised in which the last digits of the serial number were represented by coloured bars - this system was finalized shortly before the invasion of Normandy in May 1944. Unit Serial Numbers were to be painted on kit bags (and all other forms of baggage) in white (for dark coloured baggage) or black (for light coloured baggage such as khaki kit bags). Below this serial, a set of three horizontal coloured bars were used to represent the last two digits of the serial number. The top and bottom bar were to represent the "tens" digit and the middle bar to represent the "ones" digit. In the example above (repeated from an example shown in Military Artifact), the unit serial 743 is represented by the green bars (representing "4", the "tens" digit) and a yellow bar (representing "3", the "ones" digit). The red bar was an unauthorized addition, representing the suffix of the unit serial, indicating a sub unit. The kit bag could be secured closed by the addition of a locking handle as shown at right. 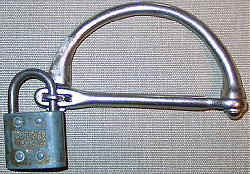 The drawstring was removed from the grommets, the lower arm of the handle was inserted in them, and then secured shut with a padlock. The upper part of the handle could be used to carry the kitbag. The final pattern issued to the Canadian Forces in the 20th Century was made of water repellent material. The bag was sewn in three pieces, with each end being a separate piece. The top was secured by a zipper and fly front with five buttons. Web tabs were located at each end of the zipper closure, with one tab having a brass grommet through which a padlock could be passed, attaching to the tab on the zipper and securing the bag closed. Two 10-inch long web ties were sewn into the fly flap halfway down the length of the flap. One end of the bag had a cellophane window into which a card or piece of paper bearing the owner's name, rank, unit, service number etc. could be placed, as well as a web carrying handle. The bag was reinforced on the bottom by two lengths of web material which also formed two large carrying handles. The bag could be slung by these handles, either on the back, or more commonly over the shoulder. This bag replaced a slightly smaller earlier version which was made in cotton duck that was less water-repellent.